Different countries, and in the case of the European Union, different continents, have different privacy regulations. Being a small business in Australia mostly means you need to be aware of and adhere to the Australian Privacy Principles which we’re written previously about here. However websites, and other online marketing activity, by the virtue of it being the world wide web, have a global reach and therefore come under the jurisdiction of the country your website visitor or email reader or Facebook fan resides in. In this article we’ll talk about the GDPR European General Data Protection Regulation. This regulation comes into effect on the 25 May 2018. Even if all the above apply, you may wish to comply with the GDPR as consumers here, will, over-time, come to expect higher privacy protection as a result of their exposure to the practices taking place overseas. Reason for non-compliance: The data was available via LinkedIn and communicating or using the data on that platform is fair, however the person has not consented to their email being used. Example 2: A person in Europe visited your website for curiosity, more information or for what-ever reason they had at the time. Your website has the Facebook advertising tag on it and you use this to remarket to them. Reason for non-compliance: The person could not reasonably know or expect they would receive advertising as a result of visiting your website and even if they knew, they didn’t consent. An example of pseudonym data is non-identifying data such as IP addresses and some information collected via cookies that is anonymous information collected and used for statistical or research purposes. However when that pseudonym data is combined with other data to create profiles which identify people it then becomes personal data. Google Analytics collects IP addresses but according to Jeff Sauer it strips IP addresses before the information gets to the reporting stage. It would appear that for most users, Google Analytics is collecting, recording and using pseudonym data for most of its work and therefore its activities can continue fairly seamlessly. However to comply with the data isn’t forever clause in the GDPR set your data retention at 36 months or some other timeframe of your choice. You will still be able to maintain the historical standard aggregated reporting that Google Analytics provides. Only highly customised reports appear to be impacted. These tools collect and use IP addresses to give contacts ratings and scores. If you use these or similar tools you may like to stop using them if they aren’t essential to your business. It would be advisable to find out more about the GDPR if you are using software or plug-ins that collect IP addresses and when combined with browsing history and website actions (such as clicks on buttons) a profile of your website visitor is developed as this would then constitute the collection of personal data. If you have European languages or currencies on your website it could be reasonably supposed that you are marketing to Europeans. Therefore if you do breach the regulations it would be difficult to talk your way out of it. Seek further guidance if this relates to your site. Having a sign up form for newsletters, to access reports, to register for a webinar or various other offers is commonplace. To sign up people to newsletters and be compliant with the GDPR they must have expressly consented to this. More about this in the email section below. The GDPR appears to accept this as pseudonym data and this is not included as the collection of personal data and therefore no further action is required from website owners and developers for these cookies. And as mentioned above CRM’s and landing page software. As such the user needs to consent to this information being collected and be given the ability to opt out if they wish. For website owners there are a bunch of plug-ins and apps available that state they comply with the GDPR but in my research and interpretation they don’t. Merely informing a person that cookies exist and giving them no option but to accept does not comply with the European privacy regulations. The image below from the GDPR WP plug-in has 3 options for the website visitor. 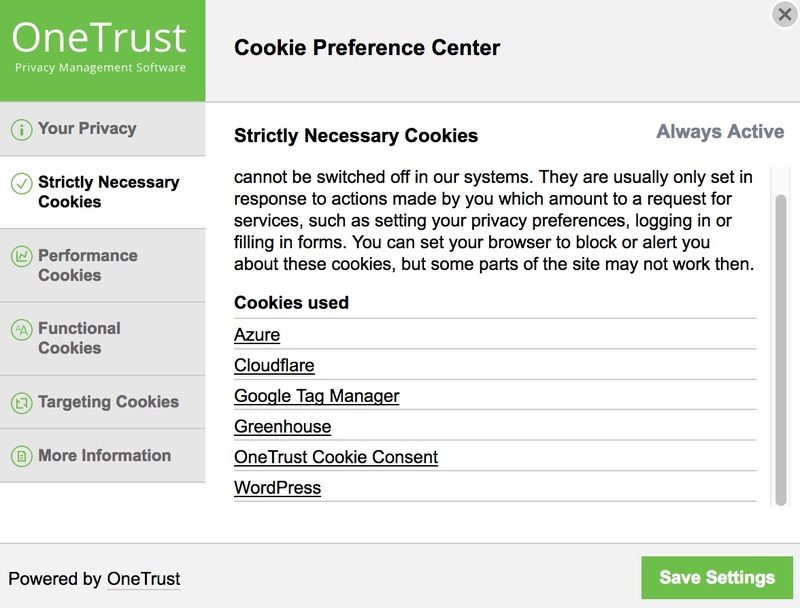 By clicking on the Cookie Settings option the user can set their cookie preferences for this site. 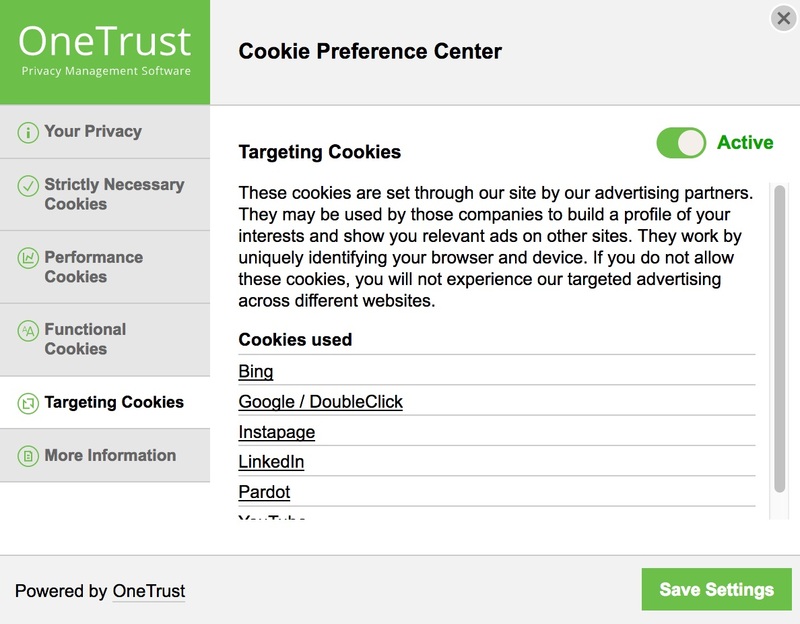 The two images below show how in the Optanon plug-in the website visitor does not have the option of accepting or rejecting the Strictly Necessary Cookies (which is set to Always Active) but they do have the option of retaining as Active or disabling the Targeting Cookies. 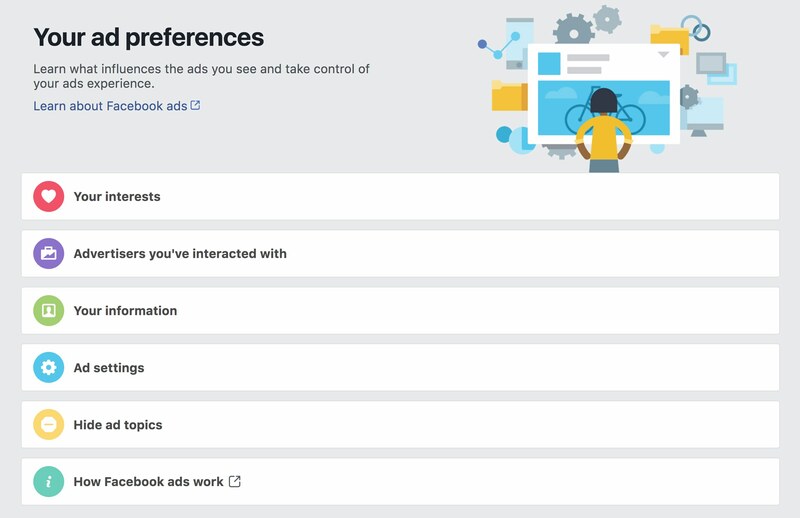 Facebook have recently prompted users to check their privacy settings and if the user works their way through all the prompts they eventually get to a part that allows them to choose (or not choose) to receive adverts based on partners, eg. data from advertisers, app developers and publishers. 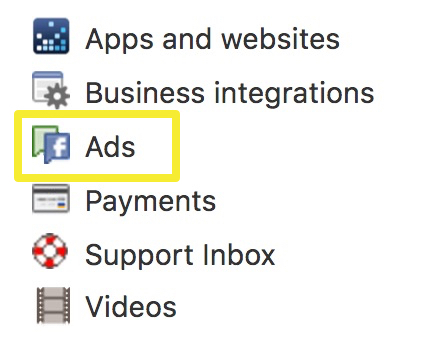 Here’s the screen that allows a user to allow, or otherwise, ads to be shown to them based on Facebook partner information. 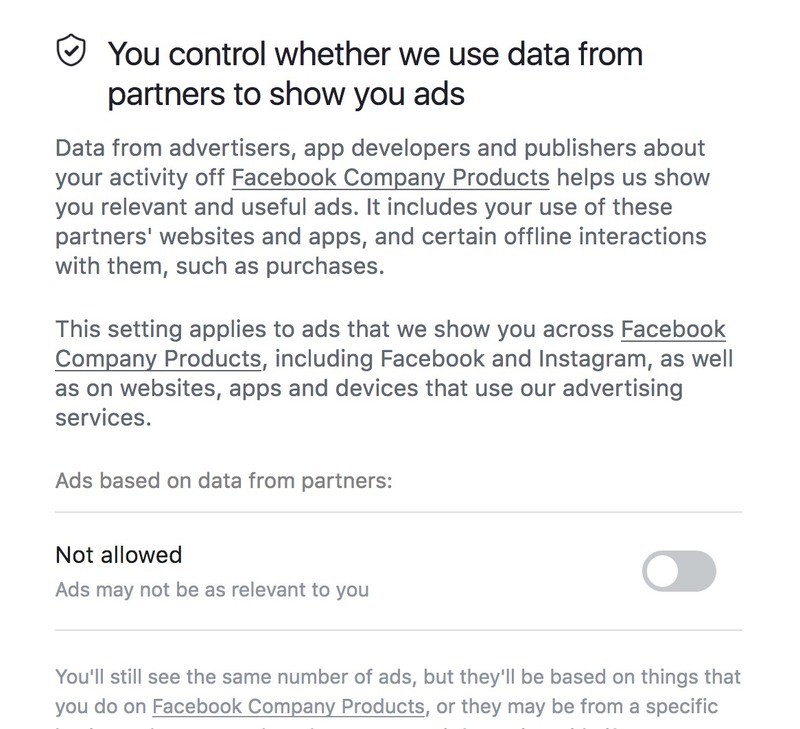 Facebook then confirms the setting and lets the user know they won’t be shown ads based on data they receive from advertisers and other partners. However they do note that they will still use this data to personalise the Facebook experience, promote safety and provide analytics as per their Data Policy. We’d have to think the above is Facebook’s way of complying with the GDPR. It is my view that to comply with the GDPR both parts of the equation need to be in place – that is Facebook needs to comply with using the data but the business owner still needs to comply for the collection of the data. Therefore the collection of data on a business website via cookies for Facebook advertising purposes (i.e. the Facebook Pixel) would still need consent from European website visitors at the time of visiting the website, as per the above cookie discussion. The same would apply to Google remarketing using their site tag. If you missed Facebook’s prompts and your super keen to check out, and possibly change, your advert settings, go to the drop down arrow on the top right of the screen (while on a desktop – may be a little harder to find on a mobile). On the left there are a lot of options in settings – down near the end you’ll find ads. Click on that. And then you’ll find yourself in a section where you can work through the various choices. Identify and sort by domain country suffix. For example the Australian domain suffix is .au, Germany is .de, Netherlands is .nl and Spain is .es. Here’s a full list of internet country domains. If their consent to be on your email list is not already recorded, email them and ask them to opt-in to continue receiving your newsletters. MailChimp has a template for this email. Here’s an example email. Canada also has an opt-in approach. Therefore if you have an international email list it would be advisable to go through the same method for Canadians on your list at the same time. Add in a source field for your email list, if you haven’t already, to complement the automated source field that probably already exists in your software. This way you can manually add information to records if and when people opt-in through an avenue other than an online form. Knowing how someone came to be on your list is required to comply with Australian Privacy Principles so you may already have this in place. A double opt-in is where the person receives an email to double-check they want to subscribe. This is best practice and advisable. If you currently sign up people to your newsletter upon a purchase of a product, registration for a webinar or from an enquiry update these online forms with a visible and obvious consent to receive a newsletter tick-box. 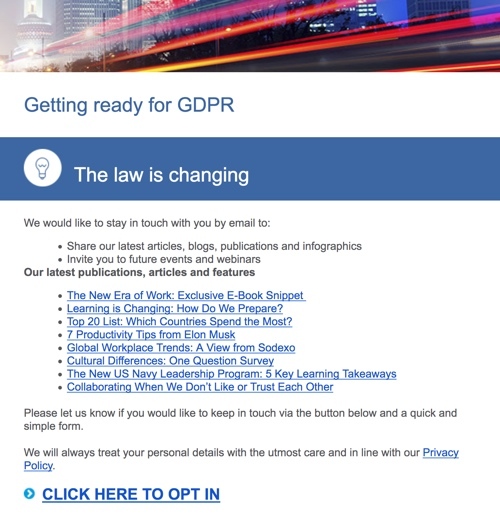 The sign up for a newsletter tick box needs to be obvious and not pre-ticked as yes if it is to comply with the GDPR European General Data Protection Regulation. I am not a lawyer. The above information is from a study of the regulations and other resources. Seek further guidance from appropriately qualified and experienced people and/or read the regulations directly to ensure your business is compliant. In addition to the websites already linked to in the body of this article, the following sites have been informative. GDPR Portal: Site Overview – a resource to educate the public about the main elements of the GDPR European General Data Protection Regulation.